Kea (or Tzia as it is also known) is a wonderful island in the Greek Cyclades. It is easy to reach from the mainland – only a one-hour ferry crossing from Lavrio – but it has limited ferry connections with other Cycladic islands. As a result, it doesn’t get the island-hopping crowds that most of the Cyclades get. The island is perfect if you are looking for (mostly) quiet with (a bit of) entertainment. Excellent sandy beaches, an outdoor cinema and some cultural events make it a great destination for summer holidays. There are some nice hotels and other places to stay, and quite a few Athenians have tastefully done weekend/holiday houses. 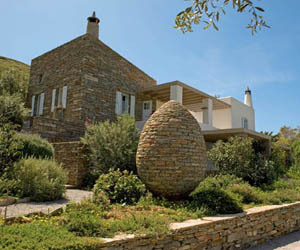 The landscape of Kea is hilly and rural, very Greek. The island has a charming hilltop hora (Ioulis) in its centre, a small port (Korissia) and a few tiny settlements. The architecture is a pretty combination of the traditional Cycladic whitewashed cube-like dwellings, neoclassical mansions and stone-built houses that blend in with the landscape. Most places to stay are near the port and the the coast. The beaches of Kea are wild and unspoiled; some are easy to reach, others require a little bit of walking. (The latter are always the best!). There are no organised beaches with loungers and umbrellas. Good! Kea is not for beach holidays only. The island is great to visit in all seasons, especially if you like walking: there is a really good network of marked walking trails.